The origins of lotteries goes back centuries. For example, the French National Lottery was already established in 1505. Back then the French king Francis I introduced the lottery to his citizens. A lot of things have changed in the past five hundred years. However, the basic rule of the French Loto is still the same. You need to pick a few numbers that match with the numbers that appear during the lottery draw. Nowadays France isn’t a Kingdom anymore, so the Loto is not in the hands of one ruler. Instead it’s organized by exploitant La Française des Jeux, which is also one of the co-founders of the popular EuroMillions lottery. At France Loto it’s all about numbers. As a player you have to choose five numbers from a range of 1 to 49 and one extra number that’s known as the ‘Lucky Number’ from a 1-10 range. Where can you buy French Loto tickets? 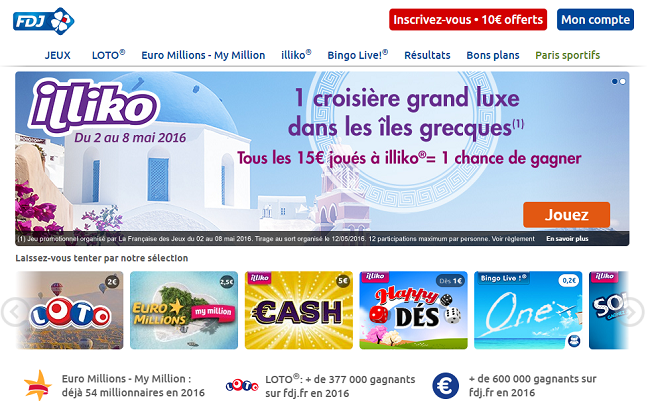 You can purchase France Loto tickets in one of the official stores or online at TheLotter. A ticket usually costs a few euros. There’s a possibility to increase your winning chances, namely by choosing a systematic form with the numbers 7, 8 or 9. A 5-line or 6-line lottery ticket might bring you luck as well. It might also help if you buy a multi-draw package of 5, 10, 25 or 52 draws. It has two advantages, namely a discount and a higher winning chance. A subscription for France Loto is a good idea as well, because in that case you participate in every draw. Besides that you get a free 10th ticket every time. You can choose your lucky numbers manually or with a quick pick. After the purchase it’s time to wait for the draw on Monday, Wednesday and Saturday evening at 20.30 GMT. One of the interesting things about the French Loto is that it offers several extra’s to win more money, including the so-called ‘Loto Raffle’. It means that you have a unique code on your lottery ticket that makes it possible to win one of 10 prices worth 20.000 euros. The code is made of one letter and eight numbers. So every time you purchase a ticket, it might be possible to win 20.000 euros with the ‘raffle’ option. Besides that, the prize money is tax free. It makes the French Loto even more exciting! It’s a good idea to have an account on the website TheLotter, because after a win you immediately receive a notification by email and SMS. The draw results are published on this site as well. Your prize will be added to your theLotter account if it’s less than 2500 dollars, which is about 2083 euros. Are you very lucky with a prize of more than 2500 dollars? Then it’s time to travel to France to collect your tax-free prize over here. Congratulations! In a lottery you have to beat the odds, because the winning chances for the Jackpot aren’t very high. However, France Loto doesn’t think there is something like ‘bad luck or bad numbers’ because it always has a guaranteed Jackpot at Friday the 13th! The Jackpot is worth at least 13 million euros. So if you win, 13 will be forever your lucky number. Sometimes it takes a while before there’s a Jackpot hit, because the maximum number of rollovers is 34.